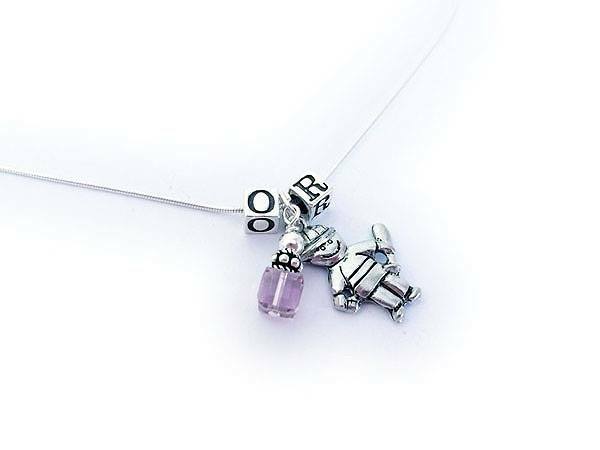 Hebrew Boy and Hebrew Girl Necklaces with Initials and Birthstones for Mommy or Bubbe. I have all the Hebrew Alphabet letters in stock. You may choose English or Hebrew. 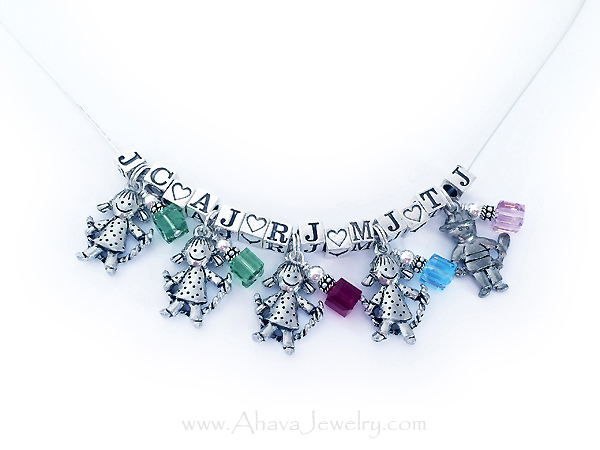 Here are some fun and beautiful Hebrew Boy and Hebrew Girl Charm Necklaces with Birthstones and Initials. Build our own add-on Hebrew Kid Charm Necklace below. You can have up to 6 sets per necklace. 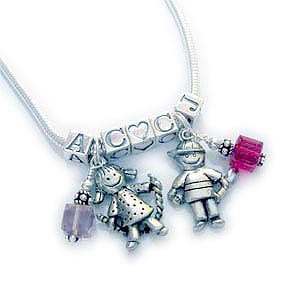 A set is 1 childs' initials (first and middle name or first and last name), 1 birthstone crystal and a Hebrew boy or Hebrew girl charm. A free heart bead will be added in between all sets. The necklaces are .925 sterling silver with the snake design. 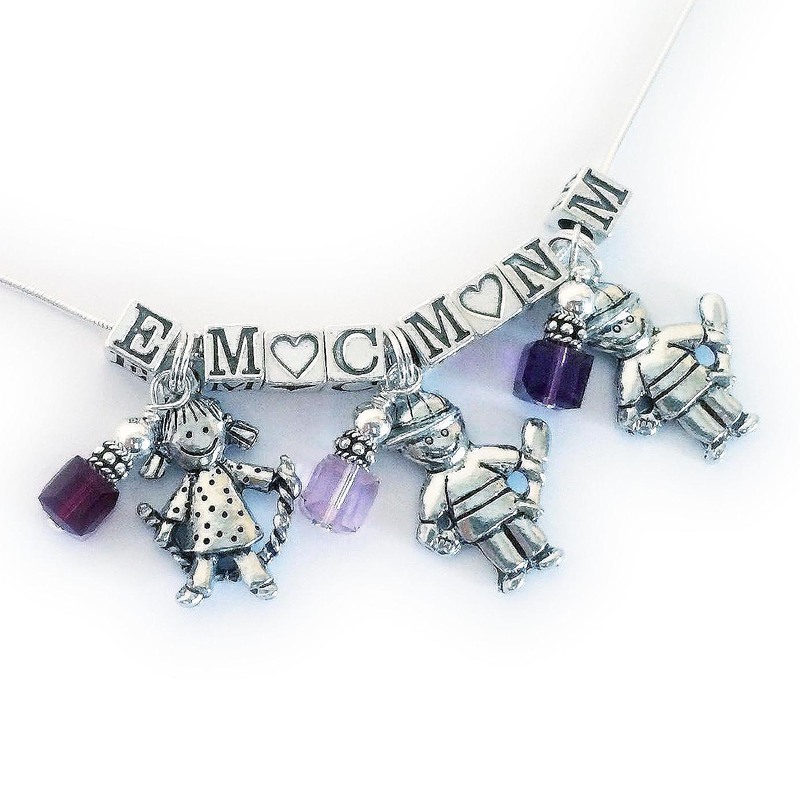 The Alphabet block letters are 5.5mm sterling silver. The Birthstone Crystal dangles are made with all sterling silver components and Swarovski crystals in birthstone color of your choice. The girl jumping rope and the boy with the bat are lead-safe pewter and Made in the U.S.A. I can personalize and customize all of my designs. I love what I get to do every day! I have all the Hebrew Alpahbet in stock!!! Linda received her bracelet yesterday. With blizzards in CO, mail was delayed 2 days, but finally arrived in her box yesterday. She LOVES it, and it's the perfect size. She put it on immediately and said that she will not take it off. Period! She leaves for Israel Tuesday, and is so excited to be wearing this during her travel, and when she will present a new business plan, before YHWH at the Wall. Thank you so much! What a blessing. Handmade and customized Hebrew bracelets, necklaces & earrings by local artisan, Leigha Montigue.